Documentation of the unpublished Greek-Dutch excavation in 1956 at Archanes on Crete was recently rediscovered and assembled. The slides, photographs, plans and notes, presented here for the first time, not only provide a vivid picture of the excavation that had fallen into oblivion, but also offer an interesting view of the methods and approaches of archaeology at the time, the ways of communication in the archaeological world and the circumstances in which campaigns were organised in the 1950s. On 30 July 1956 a curator of the Dutch National Museum of Antiquities in Leiden (NMA) with two aides-de-camp arrived at the port of Heraklion, Crete. They were members of the Greek-Dutch archaeological expedition that would excavate a Minoan site at Troullos, the eastern quarter of the village of Archanes, located sixteen kilometres south of Heraklion. Even though the campaign would not last for more than four weeks - from 31 July until 28 August - the results were promising. Thanks to the efforts of the Non-Professional Archaeological Photographs-project (Wagemakers 2014; www.npaph.com), which aims to trace and digitise photographs of past excavations, much of the overlooked Dutch documentation could be assembled. Conrad Stibbe, participant of the expedition, was able to clarify the circumstances and outcomes of the 1956 campaign and provided the author of this article with his photographs, drawings and notes from his diary which he kept during the excavation. Adriana Buurman-Brunsting, daughter of Hendrik Brunsting, who was curator at the NMA at the time and acted as supervisor of the Dutch team members, was able to oblige by showing me her father’s correspondence to her mother during his stay at Archanes. To these documents were added slides, letters and excavation plans found at the archives of the NMA. Six decades on, this expedition will now receive the attention it deserves. The publication of this documentation not only creates an impression of the unpublished excavation, but it also provides the reader with some insights into the archaeological world of those days. In 1956 the co-operation between Spyridon Marinatos, professor of Archaeology at the University of Athens and Director of the Archaeological Society at Athens, and Hendrik Brunsting, curator at NMA, was not brand new. In the preceding years Brunsting had already participated in Greek excavations at Pylos, Kanli Kastelli and Vathypetro, all directed by Marinatos (Rijksmuseum van Oudheden te Leiden 1903–1987: 151–152; NMA archive 204/56). The involvement of Brunsting in Marinatos’s excavations seems to have been the result of a fruitful meeting between them at the NMA on 27 April 1954. Marinatos was invited by NMA’s director Van Wijngaarden to give a lecture at the museum about the ‘small palace at Vathypetro’.3 Only five weeks later Brunsting received a letter from Marinatos inviting him to join the excavation at Pylos that same year (NMA archive 204/56). Subsequently, the excavations at Kanli Kastelli and Vathypetro took place in the next year. Prof. Dr. H. Brunsting, keeper of antiquities at the said museum, will make a scientific journey to Greece in July and August 1956, in order to take part in an excavation campaign in collaboration with the Greek Antiquities Service (NMA archive 201/16). On Crete Brunsting was assisted by Conrad Stibbe and Frédéric Bastet, who had both just finished their studies in Classics and Archaeology at the University of Amsterdam and Leiden respectively (Rijksmuseum van Oudheden te Leiden 1903–1987: 159). Another striking aspect that can be elicited from the correspondence is that the destination of the expedition was not known until the eve of the campaign itself. In a letter from Brunsting to Marinatos only a month before the start of the dig, he asked him to let him know where to travel to (NMA archive 204/56). Even two weeks before the curator headed for Crete, he erroneously assumed that he was going to excavate at the Greek site of Lykastos, i.e. Kanli Kastelli, where they had excavated a year before, and the Juktas peak-sanctuary (NMA archive 202/ZWO).6 In the end they agreed that Brunsting would get in touch with Marinatos as soon as he had arrived in Athens on 19 July. It was not until his arrival in Greece that Brunsting heard that the expedition would start on 28 July (Correspondence Brunsting to his wife, 20 July 1956). That was probably also the moment that he learned that they were to excavate a plot at the village of Archanes. Marinatos - in the position of Director of the Archaeological Society at Athens - acted as director of the Greek-Dutch excavation. From reading the collected unpublished letters and notes as well as looking at the old photographs and slides, it becomes clear that the Dutch members were responsible for measuring, classifying and mapping the site. They also co-ordinated Marinatos’s regular foreman and several of the hired local workers who did the actual digging. Their work was observed by a large number of the residents of Archanes who enjoyed witnessing this unusual event in their village. Troullos, where the votive deposit was found, is the eastern quarter of the village, also the location of the Minoan site, which is what the 1956 expedition was heading for. In contrast to the circumstances in the 1950s, today the modest plot with a perimeter of 78 meters is enclosed by several roads and houses. 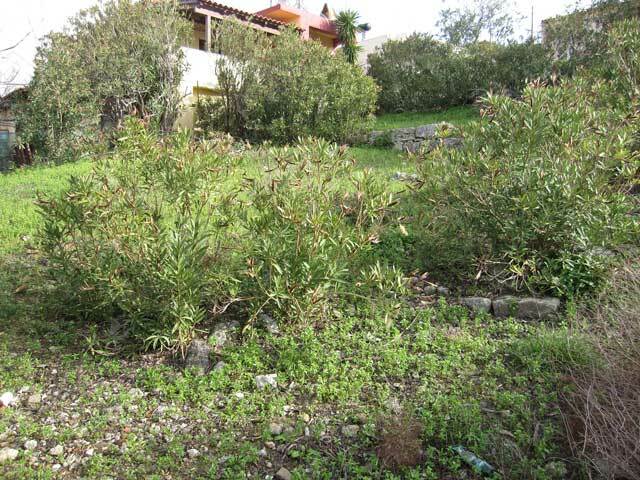 As the site is almost completely overgrown, the results of any past archaeological activities are hardly visible. A part of a monumental wall and a few blocks here and there between the undergrowth give away the location of the site (figs. 1 and 9). The overgrown site of the 1956 Greek-Dutch expedition in 2014. In the background a part of the monumental wall (photograph by the author). Plan of the site created by Hendrik Brunsting, scale 1: 40 (Courtesy NMA). Roman numbers added by the author. Slanting bare boulder at the end of the zigzag passage (Courtesy C.M. Stibbe). North-east corner of the zigzag passage taken from south-western direction. Bastet standing in the middle and Brunsting on the utmost right (Courtesy C.M. Stibbe). Section drawing of the southern wall of the zigzag passage by Hendrik Brunsting (Courtesy NMA). Monumental wall, photograph taken into north-east direction (Courtesy C.M. Stibbe). The MM-LM building, photograph taken into southern direction (Courtesy NMA). The pottery found in one of the rooms of the MM-LM building (Courtesy C.M. Stibbe). Map of Archanes including Minoan architectural remains (after Sakellarakis and Sapouna-Sakellaraki 1997: 24–25 and adjusted by Willem Beex). The Minoan remnants were discovered by chance. Construction activities on that spot - a house was being built for an couple who got engaged - had exposed Minoan building-blocks and sherds not long before the Dutch excavators arrived at Crete (Brunsting 1956: 6; NMA archive 201/16). An emergency excavation was required and Marinatos subsequently decided that this spot should be the destination of the Greek-Dutch expedition. Thanks to the Dutch records published here, it is possible to get an insight into the archaeological approach and interpretation of this dig at that time. As it seems, the excavation can be divided into three sections (fig. 2): a passage in a zigzag shape; a monumental wall; a building. Below follows an overview of all the archaeological activity that took place in that location 60 years ago. During the first week of the campaign the excavators focussed on the northern part of the plot where they encountered a four-meter-deep passage in zigzag shape which appeared to run to a dead end as it ended blocked by a slanting bare boulder (fig. 3). The solid walls of the corridor were made of neat stone masonry (figs. 4 – 5). The filling of the passage contained numerous sherds of vessels. All styles were present and some small copies even appeared to be intact. In the first horizontal part of the passage (fig. 2 - I), two small coarse terracotta bulls were found and one half of a black painted bull’s head, about seven centimetres high, with broken horns and a white circle around the eye. In the vertical part (fig. 2 - II) they found, next to fine pottery, a bronze needle, a half steatite mortar-shaped or ‘bird’s nest’ vase, a large ‘blossom bowl’ without bottom and a small terracotta idol with a large flat hat (Correspondence Brunsting to his wife, 1 August; Stibbe 1956a: notes on 1 and 4 August; idem 1956b). Platon, who visited the excavation that day, dated these finds from MM IB to MM IIIB (2000–1600 B.C.) and had them transported to the archaeological museum in Heraklion. Due to the excellent condition of the walls and the absence of strata the excavators came up with the preliminary premiss that the passage had been filled with stones and pottery debris deliberately and was not the result of nature force. 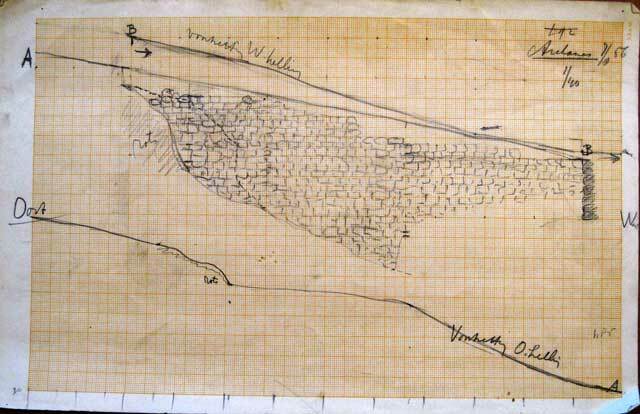 According to them the filled passage had probably functioned as a foundation for a superstructure (Stibbe 1956b). On 6 August the excavators started to expose the centre of the site. To their own surprise they encountered a structure, adjacent to the most southern wall of the zigzag passage, which was a monumental wall of about 24 meters long and two meters high (fig. 6). It was built with one-meter-long square hewn limestone blocks. 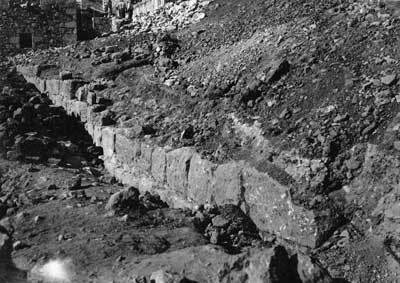 As the blocks were found in front of the surviving part of the wall, the excavators concluded that the upper part of the wall must have collapsed in the past. The huge number of building blocks that were laid bare, gave rise to the premise of there being an immense superstructure on or behind this wall. A test trench, dug in the middle of the wall (fig. 2 - III), learned that the wall was five blocks high at this point. Additionally, the trench exposed a second wall which leaned directly against the monumental one. This supporting wall was three meters high in itself and existed of coarse smaller stones. At reasonable depth in the trench LM I (1600–1450 B.C.) sherds and terracotta fragments were found. It seemed to the excavators that this building - at that moment interpreted by them as ‘a palace or other impressive structure’ - had collapsed due to nature’s force (BCH 1957: 631; Brunsting 1956: 6; NMA archive 201/16; Correspondence Brunsting to his wife, 10 August; Stibbe 1956a: notes on 7 and 8 August; idem 1956b). Five meters to the west of the monumental wall, a maze-like MM-LM (2200–1400 B.C.) complex of passages and rooms was found (fig. 7; BCH 1957: 631; Stibbe 1956b). Approximately ten solid walls gave shape to five distinguishable separated rooms. Marinatos was convinced that part of the small rooms had functioned as support of a staircase (fig. 2 - IV). Next to this spot, a pithos was found at the end of the small passage (fig. 2 - V). The other part of the building complex displayed a wall with a gentle bend over a wide stairway of which two steps were laid bare (fig. 2 - VI). Marinatos recognised this building composition from sites at Knossos and Phaistos (Stibbe 1956b). Due to its modest nature, the excavators did not identify this part of the building complex as a palace. Furthermore, on the second last day of the campaign they made an interesting discovery in one of the rooms (fig. 2 - VII). This room seemed to be filled with 50 household vessels (fig. 8). All types of pottery were present and was dated at least LM I (1600–1450 B.C. ).10 In the other rooms refuse from a neighbouring MM-LM (2200–1400 B.C.) sanctuary was found. Other artefacts found at the building complex were a blue steatite button and a building brick with a MM mason’s mark (Platon 1956: 409–413; BCH 1957: 631; Stibbe 1956b). It is obvious that Brunsting, Marinatos and Platon were satisfied with the fruitful outcome of this emergency excavation and were convinced that this Minoan site was significant (Marinatos 1956; Platon 1956: 409–413; Brunsting 1956: 7; BCH 1957: 631–632). Since they planned to continue the archaeological campaign in the succeeding years, they decided to postpone the publication of a full report. Although Marinatos had explicitly emphasised that the continuation of the excavation could only be accomplished after an expensive dispossession of the land, Brunsting announced in his augural speech, as professor of Archaeology and Prehistory at the Free University of Amsterdam on 23 November 1956, that the plot had already been bought in order to secure future archaeological research (Marinatos 1956: 223–224; Brunsting 1956: 7). That claim appeared to have been erroneous. A process of dispossession usually takes quite some time, whereas Brunsting held his speech only a few months after the end of the campaign. Besides, Marinatos’ note in which he warns for the related expense of a possible dispossession, was published in December. There is also another argument indicating that the plot was not yet secured for archaeological purposes in 1956. Returning back to the Netherlands after the end of the 1956 campaign, Brunsting immediately, together with Prof. G. van Hoorn, applied for a new grant of 3,000 guilders in order to secure the continuation of the expedition in 1957. In the first instance, the advisory committee of ZWO seemed to concede with the application as they stated that ‘continuation of the grant is desirable’. For that reason, probably, Brunsting mentioned in his inaugural speech that the Greek-Dutch expedition to Archanes would be continued in 1957. However, in the same month J. H. Bannier, the director of ZWO, wrote to the Board - who gave out the grants - that ‘it concerns here only restricted small excavations that Prof. Brunsting conducted under the supervision of the Greek archaeologist Prof. Marinatos in 1955 and 1956 and which he is willing to conduct again in 1957… Our principal purpose was to let Brunsting have archaeological experience abroad. That goal has been partly achieved. Due to our poor financial means and to the tense political situation in the eastern part of the Mediterranean Sea13, I propose to reject the application’. The Board accepted this advice and the minutes read that ‘the previous grants have achieved Brunsting’s goals of archaeological experiences abroad. As the project itself does not seem to be of great significance, the grant will not be issued in 1957’ (ZWO Archive 2.25.36/6, 34–35, 293; Brunsting 1956: 7). The assertion that the excavation did not seem to be of great significance is remarkable, particularly because Brunsting had indeed already emphasised the significance of the site and the necessity of continuation of the expedition in his report to ZWO. 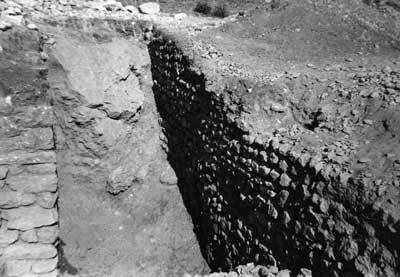 In his apply for a grant for an excavation at Archanes in 1958 he reiterates the significance: ‘We aim to continue the 1956 excavation at Archanes, Crete, where important remnants of a Middle Minoan building complex were exposed … The terrace walls found here are able to compete with all the other walls found at other sites on Crete from this period, especially at the palaces of Knossos and Phaistos. The interpretation of the remains (palace? or city?) can only be concluded with some certainty after further excavation’ (NMA archive 202/ZWO). Also Bannier’s argument of poor financial means is rather weak. In the same year the NMA curator Klasens received 25,000 guilders for his excavation at Aboe Raosh (ZWO Archive 2.25.36/6). Henk Franken of Leiden University was even given 50,000 guilders for his excavation at Tell Deir Alla, while he applied for ‘a mere’ 40,000 guilders (Letter ZWO to Henk Franken, 3 December 1959). Brunsting’s application for 3,000 guilders is in striking contrast with the amount his colleague and Franken both received. Another reason for Bannier to advise the ZWO Board to reject Brunsting’s application, found in the statement: ‘there is no bit of continuation, because it concerns a new site every year, appointed by Marinatos’ (ZWO Archive 2.25.36/34), is flawed since Brunsting applied for the continuation of an already existing excavation (namely at Archanes). For this reason the Greek-Dutch expedition did not organise any further campaigns to the Troullos site after 1956 and it seems that there was no archaeological activity at all in the vicinity of the site until 1965. 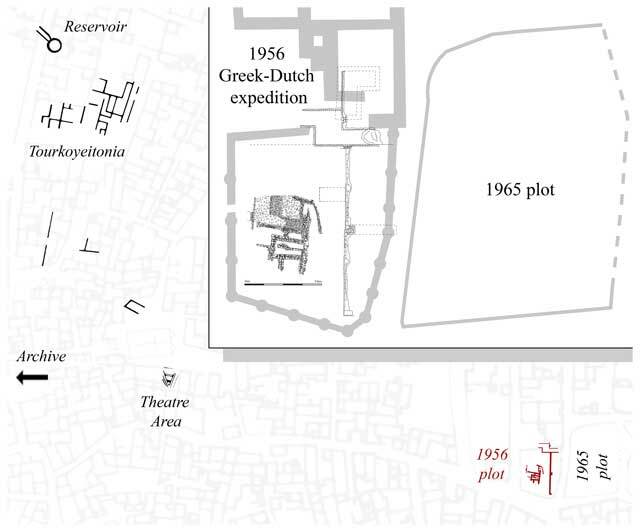 That year Yannes Sakellarakis and Efi Sapouna-Sakellaraki conducted an emergency excavation adjacent to the 1956 plot (fig. 9; Sakellarakis and Sapouna-Sakellaraki 1997: 24–25 no. 9). A new road was planned to run along the site and for that reason the area east of the monumental wall found in 1956 was excavated and brought to light a LM IA house with five rooms (Sakellarakis 1966: 413–414 figs. 447a-b; Sakellarakis and Sapouna-Sakellaraki 1997: 64–65 figs. 50, 52a-c, 137–138 figs. 103–104). As described above, the result was not quite what the members of the Greek-Dutch expedition expected to find as they assumed that on top or behind the monumental wall there would be a superstructure. 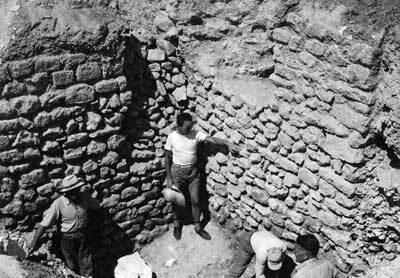 It was not until 1978 that new archaeological research was conducted at the Minoan site where the Greek-Dutch expedition had been digging 20 years before.16 Sakellarakis and Sapouna-Sakellaraki excavated the MM - LM building found in 1956 and uncovered a great variety of pottery and many fragments of polychrome stucco (BCH 1979: 607). This was the second and last time the land, where at one time an engaged couple dreamed of starting a new life together, was explored, after which the Minoan site was once again left to the mercy of nature. The assertion of the possible discovery of a summer palace at Troullos by the 1956 expedition, was rejected by Yannis Sakellarakis and Efi Sapouna-Sakellaraki after they had traced a momentous building in the centre of modern Archanes almost a decade later.18 The main part of building is situated in the quarter Tourkoyeitonia (fig. 9) and can be dated MM IIIB - LM I (ca. 1650–1450 B.C.) (Sakellarakis 1964: 185; idem 1965a: 177; Sapouna-Sakellaraki 1990: 67; Sakellarakis and Sapouna-Sakellaraki 1991: 24, 28–29; idem 1992: 59; idem 1997: 27). Due to the fact that the size - covering the centre of present Archanes -, the architecture, the materials used and the structural methods employed bear resemblance to the palaces of Knossos and Phaistos, the excavators are convinced that the building complex can be identified as a palace (Sakellarakis and Sapouna-Sakellaraki 1991: 29–30).20 Additionally, the necropolis excavated at Phourni - located between Epano and Kato Archanes on the north-eastern side of Mount Juktas - between 1964 and 1989, reveals how prominent the inhabitants of the Minoan settlement of Archanes were. At the necropolis, which was in use from 2500 till 1200 B.C., 23 burial monuments were found. In the tombs they encountered artefacts such as bronze vessels, steatite and ivory seals, a sarcophagus, glass-paste beads, golden signet-rings and ivory pyxides (Sakellarakis 1965a; idem 1965b; idem 1971; Sapouna-Sakellaraki 1990: 77–83). 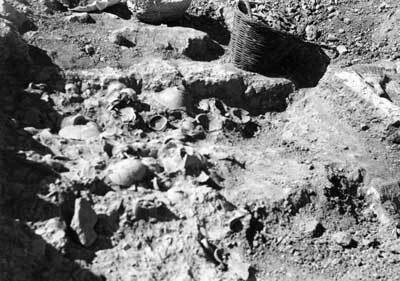 The numerous excavations conducted in Archanes in the last few decades generated much insight into the Minoan history of Archanes and the settlement’s relation to other centres at Central Crete. How different was the situation in the 1950s. The sensational hypotheses made by the excavators of the Greek-Dutch expedition were based on the outcome of a four-week campaign in 1956 and the archaeological knowledge of those days. Considering the new data provided by later archaeological research in this area, the supposition of a summer palace for the priest-kings of Knossos should be tempered. I cannot think of any sight more fascinating than the one of a prehistoric palace which is being brought to light, stone by stone, by careful, almost loving, hands, revealing secrets that have been hidden underneath the soil for thousands of years. I wondered who lived here in ancient times, on a hill facing the high mountain ridge. In my imagination I saw Minoan women treading upon the path leading to the spring, wearing wide colourful skirts, their softly swaying breasts naked in the burning sun. We came across remnants of huge amphora. They had eaten grapes, just like us, and enjoyed the abundance of life fully and with exuberance (Bastet 1959: 29). 1Stephanopoulos, who is mentioned in this passage from a novel written by one of the expedition members can be identified as Prof. Spyridon Marinatos, the director of the Greek-Dutch expedition. 2As can be expected from a novel, facts and fiction in this story are continuously mixed up together. Fortunately, Conrad Stibbe, the only participant of the expedition still alive, was able to separate fact from fiction in this novel. 3In fact, Marinatos proposed two possible topics for the lecture: the excavation at Pylos or the ‘small palace at Vathypetro’. Van Wijngaarden and Brunsting both preferred the latter (NMA archive 204/56). 4Calculated by the International Institute of Social History, http://www.iisg.nl/hpw/calculate.php (consulted on 12 February 2015). 5It seems that Brunsting applied for 3,000 guilders in total, including expenses for travel (400), lodgings (600) and the excavation fee (2,000), NMA archive 202/ZWO. Furthermore, Bastet received a travel grant of 350 guilders from ZWO to enable him to join the excavation on Crete (ZWO Archive 2.25.36/6). The Archaiologiki Etaireia covered the Greek excavation expenses (Platon 1956: 409). 6This assumption he also wrote to Bastet, who was at The Royal Netherlands Institute in Rome waiting for orders. In that letter, however, Brunsting already noticed that Marinatos liked to improvise with destinations and dates (NMA archive 200/6). 7While the dig at Archanes was still progressing, Marinatos left Vathypetro in order to explore the Zeus cave at Mount Ida. No female students were allowed to join him, due to the risk of bride kidnapping (Stibbe 1956a; correspondence Brunsting to his wife, 30 July, 1 and 10 August 1956; BCH 1957: 632). 8On 29 August 1956 Stibbe wrote that some of the artefacts had already been restored and were shown to them at the museum in Heraklion Stibbe 1956a. 9A relation between the votive deposit in Troullos and the peak sanctuary at Juktas seems obvious as many similar utensils were found at both locations (Sakellarakis and Sapouna-Sakellaraki 1991: 24). Anna Simandiraki also refers to the Minoan sanctuary at Troullos when discussing relevant sanctuaries in the immediate area of Mount Juktas (2002: 67–68). In the building complex in the central quarter of Archanes, a large variety of prestige materials and ritual artefacts has been found since 1964 (Sakellarakis and Sapouna-Sakellaraki 1997: 86–89, 98–102,106–110). This extraordinary abundance of figurines should be explained by the location of the building in the vicinity of the peak sanctuary at Mount Juktas (Adams 2006: 15–16). 10The collection at the NMA contains three pieces of LM pottery that were excavated at Archanes. It concerns a miniature jug and two small conical cups (Wiersma 2006: 118). 11This thought was based on Arthur Evans’ theory of a ‘summer palace’ in Archanes (Evans 1928: 64–66). If the building at Troullos could be identified as a palace, it would have been - in 1956 - the fourth palace found on Crete after the ones at Knossos, Phaistos and Malia. Hagia Triada was considered to be a residence affiliated with the palace of Phaistos (Brunsting 1956: 7). Stibbe, on the contrary, responds soberly to the palace hypothesis of Marinatos, Platon and Brunsting, writing: ‘The complex makes a modest impression and at this moment nothing refers to a palace. Only the vase assemblage is rather prosperous’ (Stibbe 1956b). 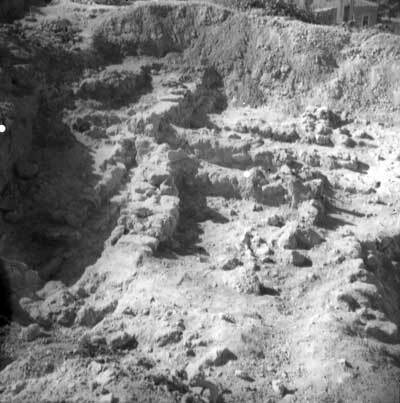 However, Brunsting also remained cautious when he writes to ZWO that the excavation at Archanes was very important and that the interpretation of the exposed remnants - a palace or city? - was only possible if the campaign would be continued (NMA archive 202/ZWO). 12Evans, who found a MM III (1700–1600 B.C.) votive deposit at Troullos, suggested that this place marked the ancient starting place for pilgrimages to the peak-sanctuary of the Juktas. He considered Archanes to be a significant Minoan centre including a ‘princely residency and votive station’ (Evans 1921: 159, 623; idem 1928: 64, 66). 13Bannier probably made a reference here to the tensions in the Near East at the time due to the foundation of the state of Israel in 1948 and the defeat of King Farouk in Egypt. 14The fact that Brunsting had not at all expected a rejection of the grant application is also evident from a passage in his 1956 account, which he sent to ZWO on 14 January 1957: ‘Continuation of the research, started in Archanes this year, is a matter of great archaeological importance; the Greeks certainly will decide to continue here.’ (NMA archive 202/ZWO). He also emphasised in his application for a grant to fund an expedition in 1958 that ‘the interruption of the expedition in Archanes in 1957 was deeply regretted by both Marinatos and himself’ (NMA archive 202/ZWO). 15Letter Henk Franken to ZWO, 27 August 1960. In his letter Franken notes the composition of the Tell Deir Alla team. After mentioning the name of Brunsting, Franken adds the remark: ‘after consultation ZWO and the person concerned’. 16The 1978 campaign took place four years after Marinatos had passed away and one year after Brunsting had retired. 17The hypothesis of a palace at Tourkoyeitonia is not undisputed, see for instance Adams 2006: 5 n.50; Branigan 2000: 385; Rehak and Younger 1998: 102. 18On the other hand, they admit that the artefacts and architecture found at Troullos imply the presence of an extraordinary significant part of the Minoan settlement or perhaps an extension of the palatial building. They do not even exclude the possibility of a ‘small palace’ (Sakellarakis and Sapouna-Sakellaraki 1991: 24). 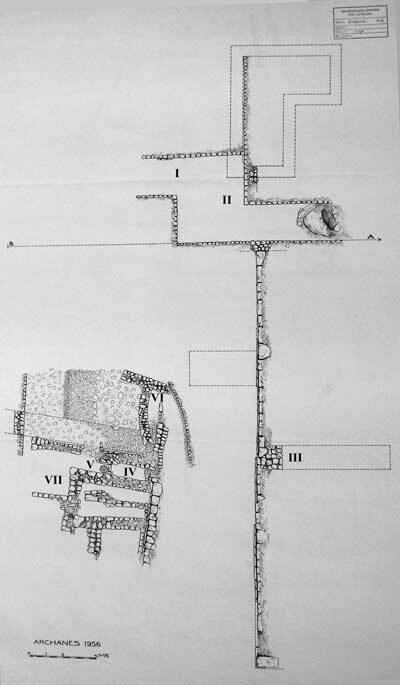 19Remnants of the building complex were found at: Tourkoyeitonia; in the area of the reservoir; the so-called Theatre Area; the Archive Area (Sakellarakis and Sapouna-Sakellaraki 1991: 27; idem 1992: 59). 20In 1967 mason’s marks found at the site were also a reason to identify the building as palatial (Sakellarakis 1967: 277). 21I believe it would also be worthwhile to publish in the future all the data on the artefacts excavated in 1956 which were brought to the Archaeological Museum in Heraklion by Nicolaos Platon. I am grateful to Ruurd Halbertsma (NMA), Adriana Buurman-Brunsting and Conrad Stibbe for providing me with the unpublished documentation of the Greek-Dutch expedition and for their implicit support for this research. I am also indebted to Peter Jan Bomhof (NMA) for digitising the slides made by Hendrik Brunsting, to Willem Beex for offering his expertise in creating an accurate map, and to the Faculty of Education, University of Applied Sciences Utrecht, for providing me with a travel grant which enabled me to visit Archanes. Last but not least, I am grateful to the anonymous reviewer who made helpful comments on an earlier draft of this article. Bastet, F (1959). De Aardbeving. Amsterdam: Arbeiderspers. Brunsting, H (1956). Kreta en de Mythologie. Rede bij de Aanvaarding van het Ambt van Buitengewoon Hooglelaar in de Klassieke en Praehistorische Archaeologie aan de Vrije Universiteit te Amsterdam, Uitgesproken op 23 November 1956. Groningen/Djakarta: Wolters. Bulletin de Correspondance Hellénique (BCH) (1957). Archanai. 81: 631–632. Bulletin de Correspondance Hellénique (BCH) (1979). Archanai. 103(2): 607. Evans, A (1928). The Palace of Minos at Knossos. A Comparative Account of the Successive Stages of Early Cretan Civilization as Illustrated by the Discoveries. London: MacMillen and Co, Limited. II Part I.
Evans, A (1935a). The Palace of Minos at Knossos. A Comparative Account of the Successive Stages of Early Cretan Civilization as Illustrated by the Discoveries. London: MacMillen and Co, Limited. IV Part I.
Evans, A (1935b). The Palace of Minos at Knossos. A Comparative Account of the Successive Stages of Early Cretan Civilization as Illustrated by the Discoveries. London: MacMillen and Co, Limited. IV Part II. Marinatos, S (1956). Praktika tēs en Athēnais Archaiologikēs Etaireias tou etous, : 223–225. Rehak, P and Younger, J (1998). Review of Aegean Prehistory VII: Neopalatial, Final Palatial, and Postpalatia Crete. American Journal of Archaeology 102(1): 91–173. Rijksmuseum van Oudheden te Leiden (1903–1987). Verslag van den directeur over het jaar 1903–1987. Den Haag: Staatsuitgeverij. Sakellarakis, J (1964). Mauerzeichen. Kadmos 3: 185. Sakellarakis, J (1965a). Arkhanes 1965. Report of the Excavations. Kadmos 4: 177–180. Sakellarakis, J (1965b). Ysterominoiko Kenotafio Stis Archanes. Archaiologikon Deltion 20: 110–118. Sakellarakis, J (1966). Troullos. ArchDelt 21: 413–414. Meros B.
Sakellarakis, J (1967). Mason’s Marks from Arkhanes In: Brice, W ed. Europa. Studien zur Geschichte und Epigraphik der frühen Aegaeis. Festschrift für Ernst Grumach. Berlin: Walter de Gruyter & Co., pp. 277–288. Sakellarakis, J (1971). Das Kuppelgrab A von Archanes und das Kretisch-Mykenische Tieropferritual. Praehistorische Zeitschrift 45: 135–218. Sakellarakis, J and Sapouna-Sakellaraki, E (1991). Archanes. Athens: Ekdotike Athenon S.A..
Sakellarakis, J and Sapouna-Sakellaraki, E (1992). Archanes-Tourkoyeitonia In: Wilson Myers, J., Emler Myers, Eleanor and Cadogan, Gerald eds. The Aerial Atlas of Ancient Crete. Berkely-Los Angelos: University of California Press, pp. 59–62. Simandiraki, A (2002). Middle Minoan III Pottery from Building B of the Peak Sanctuary of Mount Juktas, Crete, and a general re-assessment of the Middle Minoan III Period. University of Bristol. I [Dissertation]. Stibbe, C (1956a). Diary, [unpublished]. Stibbe, C (1956b). De Opgraving te Archanes (Creta), [unpublished]. Wagemakers, B (2014). The Digital Non-Professional Archaeological Photographs Archives: Private Photographs of Past Excavations for Current Archaeological Research. Archaeological Review from Cambridge 29(2): 50–68. Wiersma, C (2006). Sherds from Knossos. The Minoan Sherd Collection of the National Museum of Antiquities in Leiden. Pharos. Journal of the Netherlands Institute at Athens 14: 118. Xanthoudides, S (1908). Ek Kretes. Efēmeris Archaiologikē, : 197–244. Xanthoudides, S (1909). Ek Kretes. Efēmeris Archaiologikē, : 179–196.